You might have heard of Japanese taxis’ automatic doors, but have you actually ever seen them? Maybe not, because the automatic taxi doors are very unusual and unique to Japan. In Japan, you just wait by the rear door until the taxi driver opens it with the push of a button or lever on the console. Don’t try to open the door by yourself, even in a hurry, or the driver may say “step back!” (or the door may hit you ^^;). The rear left passenger door is controlled with this opening device. 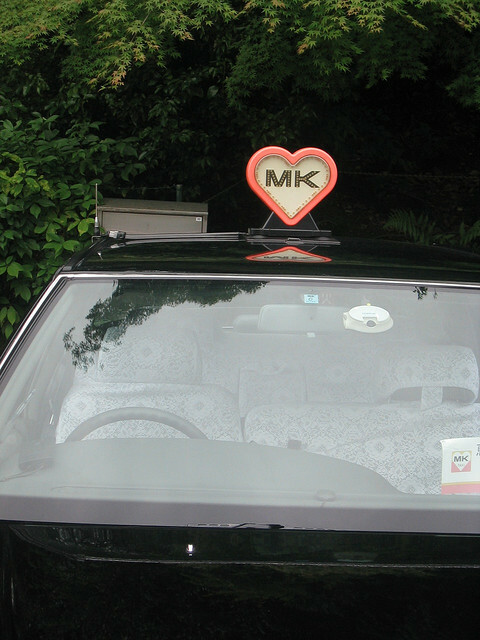 Most Japanese taxi doors open automatically, but a taxi company called MK offers a more old-fashioned service. The MK drivers are just like chauffeurs! They get out of the taxi and open the rear door for you immediately. And they always remember to hold their white-gloved hand over the side of the car to protect your head when entering. So, You don’t have to open taxi doors in Japan, no matter what! If you visit Japan, try both ways (^^)/. The taxi fare in Japan is quite expensive, though…..